* Multiple Rouge draws you in with the standard Bath & Body Works fruit bomb on high alert – berries, orange, peach, pineapple. * It’s so loud, brazen, and overwhelming that its actually charming. * Then after about 30 minutes – the aliens come. The fruit goes metallic, like robots have brought you fruit from their home planet. The fruits become less obvious to pick out and more of a mush with a strange apple, a tart pear, mashed berries, and peach. * If you watch America’s Next Top Model, this is the scent of Ugly Pretty. * The alien fruit continues to transform as immortelle comes in with a burn caramel which adds an odd grounding to the scent. It isn’t sweet but feels more warm (and possibly human). Summary: Have you ever been with someone who said, “Hey this tastes like crap, try it.” As inviting as this sounds, you put on your game face, try it and end up liking it. 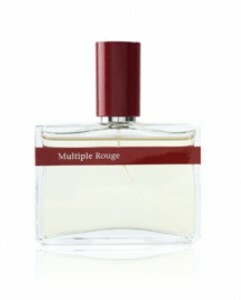 Multiple Rouge is kind of like that. It’s so odd and out there that it’s charming and lovable in its madness. Others have compared to Secretions Magnifique, and I get that with the metallic and off-putting nature- but there is a big difference, Multiple Rouge is wearable and could be considered pleasant. I’ve gone through two full samples of this scent just because I am fascinated by the strangeness of it. With its strong projection and odd smell, it is definitely not office-friendly. I see this being the perfect scent for an outsider, an artist, or just a unique/quirky person who lives on the edge of society. Longevity is kind of insane, more than 24 hours and through a shower. Multiple Rouge is definitely worth sampling for an experience and I predict that if you love it, you will really love it and begin a cult-like obsession with this strange beauty.